My daughter was really into sea creatures last year, so naturally, that was the theme of her party. I used a free template for making a little octopus stuffie from the FutureGirl blog. 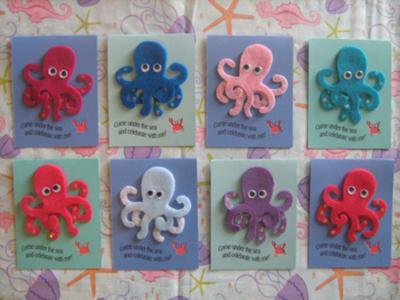 I traced them onto eco-felt and painstakingly cut out all the little tentacles! 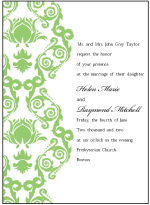 Then I glued them onto cardstock that I had already printed the wording onto and cut to size. Next came the gluing on of googly eyes and sequins (for the "suckers" on the tentacles)...lots and lots of tiny glue dots! 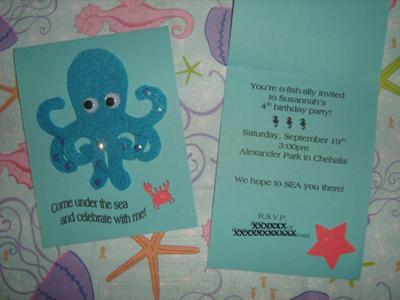 I used a crab paper punch in the lower corner of each invitation and glued a glitter-paper starfish (made from a star paper punch) on the inside of the invitation. 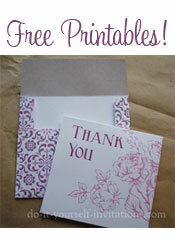 Here's the wording (riddled with puns, of course): "Come under the sea and celebrate with me! You're o-FISH-ally invited to a birthday party...We hope to SEA you there!" Wanna see another example of Megan's craft genius? Check out her Banana Split Birthday Invitations!